I hope you all had a great weekend. We did. Friday night we got to go out on a date so that was really nice. And we spent the rest of the weekend together as a family doing all kinds of fun stuff! I just hate when the weekends end! I wore this outfit yesterday. I am really in love with this dress. It is chambray which is my favorite and I really love the off the shoulder trend that is really huge right now. My dress is almost sold out online so I limked a few others that I really love. Thank you all so much for reading! Happy Monday! So happy that I ordered this dress! That is really the perfect summer dress! 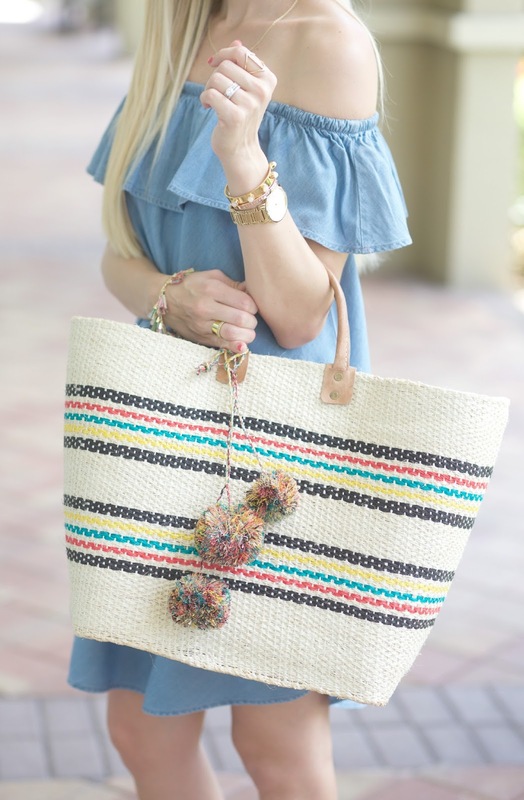 Love your tote too! Those pom pom details are very cute! The dress looks amazing on you!! I love that it is chambray!! You look beautiful in this denim dress!! I like it a lot! That dress is gorgeous! I love the off the shoulder style and the shoes! http://trendkeeper.me .. The easiest hairstyle! Absolutely love this off the shoulder dress. Gorgeous!! That is such a beautiful wash of denim for summer. Love the way it pairs with your gold jewelry! I love everything about this!! The sunglasses are perfect! That dress looks so pretty on you, Jade!